WHAT IS "PROJECT TELL TAYLOR?" As a lot of you know by now, my debut novel Remembrance was inspired by Taylor Swift's "Love Story" music video. I talked all about it in a blog entry a few months ago, discussing how Remembrance was inspired by Taylor Swift's "Love Story" music video. I even wrote a letter to Taylor Swift and sent it to her, along with a signed book! It's been a few months now, and I have yet to hear back from Taylor that she received the letter and book. I don't even know if she ever saw it (I kind of doubt she did). I really want to tell Taylor about how inspiring she and her music have been to me, but since Taylor Swift is an international superstar, she’s a little hard to reach. This is where YOUR help comes into play! I am giving away the biggest prize pack I've offered yet, and the ways to enter to win are by telling Taylor Swift about Remembrance. Here is the MASSIVE PRIZE PACK I'm offering for the Project Tell Taylor Giveaway! 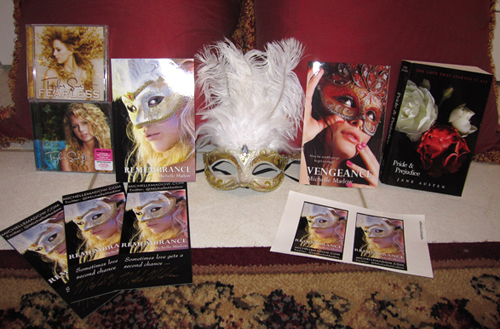 ~ Plus two NEVER BEFORE SEEN prizes that are exclusive to this giveaway!!! These two awesome prizes will be announced on February 1, when the giveaway begins). Now I *hope* you're wondering, "How can I help?!" Put this button in your sidebar, and have it link to this blog entry. This will be organized similarly to a blog hop. Sign up on the Linksy to participate in Project Tell Taylor on February 1!! 6) You must either have the Linky list at the bottom of your page or link back to the Project Tell Taylor post of one of the hosts or co-hosts. This is BRILLIANT!!! I love it. Signed up straight away, heading to my blog-editing tools now! Michelle, I'm not going to participate in the hop, but I will put the button up on my blog and will be more than happy to tweet to Taylor Swift for you on that day. This is genius!! I'm SO going to participate :) Eek, this is exciting - how cool would it be for Taylor to tweet about Rememberance? Out of this world cool! lol Great idea, I'm with you all the way, can't wait till February 1st! HELP MICHELLE! Even if you don't like Taylor Swift, it's not just about her, it's about getting word out for Michelle. I so totally love this!! This should get Taylor's attention for sure! Do we do a post now, or on Feb 1rst? Excellent idea plus i love Taylor. Definitely will support. This is an awesome idea and I am glad to participate. I think it will be really fun!! I tweeted about the sign ups for you too. Love the idea! I added mine already. But I have a question though. How do you add the inlinkz to your blog? Kudos again on such a great idea! oh I love it! just signed up :) i'm new to all this so I might need help with the rafflecopter thing but i'm so in ! Hey Michelle! I signed up, but I did something wrong and my link isn't working. (I hadn't had my coffee yet!) Is there a way you can delete it and I can re-enter it? It's "Britney" in the linky list. SORRY! I know better than to try to operate without coffee! I put the Button on my side bar and I added my link!!! I definitely will do that Michelle. Taylor Swift is my favorite singer! I have not read the books yet, but they sound wonderful and I would love to help! I's going to try and help as best as I can. I hope Taylor sees this book! I LOVED it! Cheers and best of luck! I just made a post to help and made a giveaway for a copy of your book also. I have been super busy and just go to do this and was wondering if there was any way I could get on the hop link list? I didn't realize it was closed until I was getting ready to add it. :( either way I'm happy to help, i just figure more tweets if another blog is on the list! i wanna help!!!! what rafflecopter entry form are you referring to and how to i formally sign up?! I have not had the chance to read Remebrance yet, and I am not sure I like the idea of reicarnation, but I stil want to help you tells Taylor Swift. I would love to win the books, too, since my library does not have them. I know what it feels like to have someone not respond to your letters, so I will put this on my blog. Your instructions are a little confusing, though, since I have never done something like this before. Could you explain? WHY haven't I found this earlier?? I LOVE TAYLOR SWIFT so much and I'm so curious about your book! Btw, how did it go? Avoid buying the costly edition of games, unless they are a favorite. Many times, video games will have a special edition, but it isn't necessary to have in order to play the game. By not purchasing the special edition you can save money on the video game and still enjoy it.